The beginning of the year is an exciting time for Pack 121--particularly because of all the new faces that come into our Pack! If you are a new family to our Pack, and to Cub Scouts, we welcome you and want you to know how happy we are to have you with us! For boys that are brand-new to Cub Scouts, there is no time wasted before earning their very first rank badge--the Bobcat badge! All new scouts, regardless of age/grade level, must earn this badge first. Our goal is for all new scouts to complete their Bobcat badge requirements in time for the October Pack Meeting, at which time we'll have a special ceremony to present the boys with their very first earned badge! 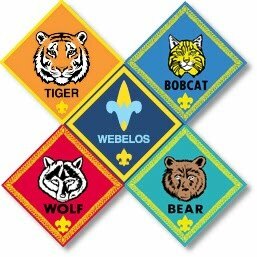 *In Cub Scout packs, Akela is a symbol of wisdom, authority, and leadership. Akela is anyone who acts as a leader to the Scout. Akela can be a Cubmaster, Den Leader, parent or teacher depending on where the guidance takes place. In den meetings, it is the Den Leader who is Akela. During pack meetings it is the Cubmaster. At home, the parents fill this role.